The location of the snow lines for volatiles can affect planetary formation. Recent research has indicated the water snow line, shown here, lies farther out than previously suspected. Astronomers have identified the point where carbon monoxide (CO) freezes in the disk around a sunlike star — information that could help them understand how planets form. A team of international scientists has calculated the CO "snow line" for a star called TW Hydrae, determining that the gas solidifies at about the distance of the orbit of Neptune, where it could help feed the formation of the outer edges of the system. Volatiles like carbon monoxide freeze at a range of temperatures, and each can have its own impact on the growth of orbiting bodies. Stars form when a disk of dust and gas collapses in on itself due to gravity. The remaining material continues to orbit the newly formed object in a disk of material. 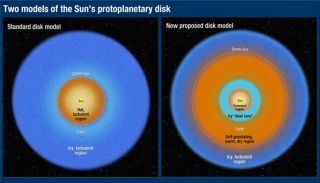 As dust and gas particles pass through the disk, scientists say, they come together to form larger and larger clumps that can eventually grow into planets. Frozen volatiles help this process along. "The snow line provides more sticky solid grains, and enhances the planet formation efficiency and grain growth," Qi told SPACE.com in an email. But determining the location of these grains can be a challenge. Emission from volatiles along the outside of the disk can make it difficult for scientists to image the telltale signs of frozen compounds. In order to locate the region of the disk where CO freezes, Qi and his team utilized a new technique. Using the Atacama Large Millimeter Array (ALMA) in Chile, they searched for the ion diazenylium (N2H+), rather than the hard-to-find carbon monoxide, around TW Hydrae, which lies 176 light-years from Earth. "N2H+ is easily destroyed in the presence of CO gas, and is abundant where CO has frozen out," Qi said. The new technique should be helpful for studying the CO snow lines of other stars, which will provide more insight into how outer solar-system objects form. "As long as the disk is gas-rich, so that there should be enough N2H+, we can use this ion to image the CO snow line," Qi said. Finding the "tracer ion" N2H+ requires a telescope with high resolution and sensitivity. ALMA, which consists of 66 23- and 39-foot-long (7 and 12 meters) telescopes that form an instrument 10 miles (16 kilometers) in diameter, observes the sky at millimeter and submillimeter wavelengths, enabling it to take a closer look at the evolution of planetary systems around other stars. "We tried to observe this ion to image the CO snow line before ALMA but failed," Qi said. The research was published online in today's (July 18) edition of the journal Science. TW Hydrae, which is also known as TW Hya, is the closest solar-type star with a gas-rich disk. This disk is only slightly larger than the one that scientists estimate surrounded the sun early in its history. As such, the CO snow line for the early solar system likely lay at a similar distance as the one around TW Hydrae, researchers said. "CO ice may have contributed to the feeding zones of Uranus and Neptune," Qi said. Comets contain varying amounts of carbon monoxide, suggesting that they formed at the outer edges of the CO snow line. The more distant Kuiper Belt objects, such as Pluto and other dwarf planets, contain both carbon monoxide and nitrogen gas, implying that they formed beyond the line. Snow lines for other volatiles exist at a variety of ranges. "The water snow line is key to the formation of gas giants like Jupiter and Saturn," Qi said. Because water freezes at higher temperatures than carbon monoxide does, its snow line is closer to the star. "The effects of the snow line on planet formation should be generally applicable to different volatiles, with the exception that the 'stickiness' of the icy grains varies," Qi said. He and his team intend to continue studying the sunlike star in search of other snow lines in the system. "TW Hya is an ideal template to study planet formation in the solar nebula," Qi said. "We also plan to image the CO snow lines for other young stars to explore the statistics on how snow-line locations depend on the evolutionary stage of the disks."